I would like to receive occasional information and updates from Andy Payne Fund A Nurse and jumblebee. 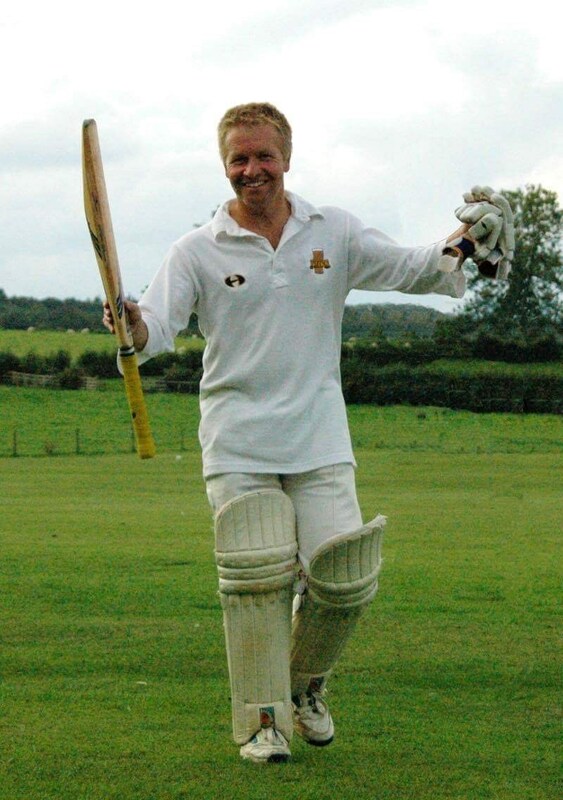 Last July,a much-loved cricketer and friend died of leukaemia,aged only 55. Andy Payne left a widow,three children and a massive gap among mates accumulated in the West Midlands down the years at King’s Heath,BBC Midlands and Belbroughton PfP Strollers cricket clubs – not to mention the team on BBC’s Gardeners’ World,where he was such a valued and popular cameraman. Andy was a great one for getting on with things,no waffling but action. So instead of moping around,saying how much we all miss such a great team-mate and friend,we’ve decided to be practical and try to organise something in his memory. Andy died in Birmingham’s Queen Elizabeth Hospital,the base for world-class scientists and clinicians who battle against blood cancer. An appeal has been launched to help raise £1m that will help enhance the Centre for Clinical Haemotology’s ambition to establish effective treatments of all blood cancers within 25 years. This would help fund even more vital research,enhancing Birmingham’s global reputation. In tandem with that fantastic aim and fundraiser,Andy’s many friends are trying something tangible to commemorate what he meant to us. We are looking to raise £30,000 to establish the ANDY PAYNE FUND A LEUKAEMIA NURSE project. A bit of a mouthful,yes,but it simply means paying for an extra specialist nurse who can administer vital research. That nurse will be specially trained in exact disease diagnosis and how to help the patient progress. The necessary trials with drugs will be researched by the nurse (conforming to Dept of Health standards),acting as the crucial link between doctors,patients and the drugs developers. Auction Ends 16th August 19.00 hrs except Lot 15 which closes 30th July. We hope you agree there are a few auction items in there that could fairly be described as in the 'Money Can't Buy' category. It sounds a lot, £30,000 - and it will only pay for a trials nurse for a year. But if our project helps to save just one life in Andy Payne's memory, we won't have laboured in vain. Having seen how hard Andy battled in his ultimately fruitless struggle, and how much he valued the medical assistance he had at the QE, we think something like this appeal is in keeping with his uncomplaining, practical nature. He was never one for fanfares, even when scoring any of his many hundreds down the years. In the bar afterwards, you'd never know if Andy had scored a century or a duck. He treated those twin imposters just the same, as well as in the final, devastating years of his life. There's absolutely no reason why this particular appeal for this human being should resonate with you at a time when there are so many deserving causes needing support. That would certainly be Andy's trenchant opinion. But his countless friends are going to try this summer to make a difference. Thanks for getting to the end of this appeal. 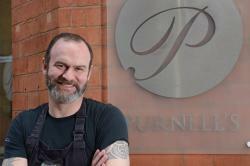 Join Michelin Star chef Glynn Purnell at his restaurant in Birmingham city centre for a memorable experience with the best chef ever to come out of Brum. Start with a champagne reception at Purnell's with the man himself,followed by a tour of his kitchen. Pick up a signed copy of Glynn's latest book 'Rib Ticklers and Choux-ins',and a Purnell's apron. Then finish with a tapas Brummie-style,drinks included. All at a restaurant that's a regular in all the best culinary guides. For four people, at a mutually convenient date. 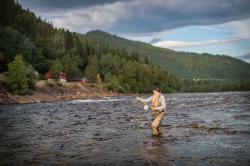 One week´s flyfishing for two rods on one of Norway,s premier rivers, the Gaula, as guests of Winsnes Fly Fishing Lodge. The lot is for the 2018 season (week to be agreed with the lodge). Fully catered with light guiding. Sutiable for seasoned salmon fishers and novices alike, expereince the magic of the Norwegian summer. The lodge is owned by the Winsnes family and Matt Hayes, well known broadcaster and fisherman from the UK. JOE ROOT'S SIGNED BAT Joe signed this bat on the morning he skippered England for the first time in a Test. It comes in a case with a photo of Joe tossing the coin on his debut as captain,along with the Lord's Test scorecard,signed by him,commemorating his memorable hundred. It all comes in a high quality frame by the UK's leading framers,Sportsframe. A batting masterclass in the Edgbaston nets with IAN BELL,Warwickshire captain,with over a hundred England Test caps. Ian will put you through your paces for an hour,ironing out your various technical defects. You’re bound to emerge a better player! 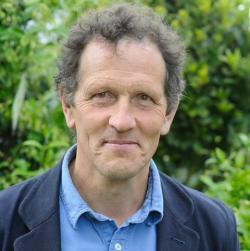 'VISIT MONTY DON AT LONGMEADOW. A truly unique chance to visit Monty Don at Longmeadow, his personal garden and home to the BBC's Gardeners' World programme. 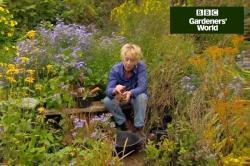 Walk with Monty through this iconic and beautiful garden and find out how he has created each element'. ENGLAND FOOTBALL EXPERIENCE. A day out at St George’s Park,England’s football centre,early in October to see the senior squad training at close quarters before two World Cup qualifiers. Then a tour of St George’s Park,a unique look behind the scenes,conducted by Aidy Boothroyd,England’s Under-21 manager. Available to four people. An ideal day for a football-mad family! A DAY WITH HEREFORD & WORCESTER’S FIRE AND RESCUE SERVICE. Come to Bromsgrove Fire Station for the day and see the fire service in operation. Tailored to your requirements,you can join in with operational training. Learn what it’s like to work in a simulated fire,using breathing apparatus. Take part in cutting up a car in a road crash scenario,or other types of specialist rescue. You’ll be wearing the uniform and get to ride on a fire engine. The day will be built around the ages of those winning the bid and what they’d particularly want to do at the station,within necessary safeguards. Lots of great photo opportunities. Ideal for a parent and child,or even two adults wishing to live out a long-held fantasy! TWO DAYS WITH ASTON VILLA. 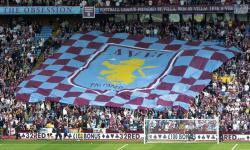 Come and meet the Villa manager,Steve Bruce and watch him train his players for the home match next day at Villa Park. Then pick up two tickets for the directors’ box for tomorrow’s game. 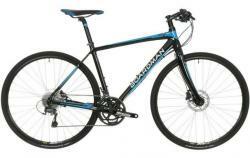 A BOARDMAN HYBRID TEAM BIKE. Retailing at £500,with a 49cm frame,it’s a superb,fast,stable bike in all conditions with flawless handling and braking power. Kindly donated by Halford’s UK. JAGUAR EXPERIENCE DAY. A special day out for those who love sleek,elegant cars. An accompanied drive in a Jaguar E type,one of Jaguar’s own collection,through the leafy lanes of Warwickshire. Then stop off at the British Motor Museum at Gaydon to enjoy the historic motor exhibits – and lots more! NOTE – The winning bidder must be over the age of 23 and the drive will be Monday to Friday between 0900-1700. A COACHING SESSION WITH CHRIS WOAKES. Join the England all-rounder and Player of the Year in the nets at his home Edgbaston ground for a one hour lesson in how to improve both your batting and bowling. A kindly chap,Chris will concentrate on the good aspects of your game and encourage with tips. So don’t worry if you’re not that good a cricketer! IN THE STUDIO WITH 606. Get behind the scenes with the nation’s biggest football phone-in. Join Robbie Savage in the Radio 5Live studio on a Saturday night in Salford. Sit in the control room,watching the calls come through and watch how the 606 producer and Robbie react to what the fans want to talk about. Robbie might even get you on air to find out who’s your favourite team! An ideal item for a parent and child. 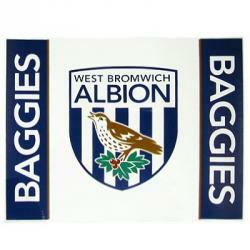 THE WEST BROM EXPERIENCE. 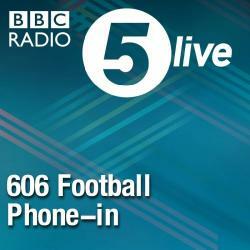 Join Radio 5Live’s Pat Murphy at the West Brom training ground one Friday morning. Watch West Brom’s manager Tony Pulis deal with the press conference,sit in on his radio and TV interviews,then join him on the touchline,as he finalises his preparations. He’ll even let you interview him – certain you’ll do better than the regular reporters! Then on Saturday,join Pat Murphy up in the gods on the Radio gantry at the Hawthorns and after the game come down to the dressing-room to watch all the post-match interviews. A unique insight into the media’s world of football reporting. 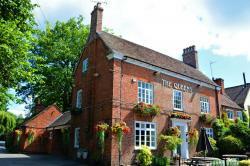 Join them at a classy pub restaurant in rural Worcestershire to discuss Aston Villa, Glasgow Celtic, Brian Clough, playing and managing in World Cups and Euros. And fighting leukaemia. Pat Murphy from BBC's Radio Five Live will pour the drinks and handle the selfies. For two people. Monday to Friday. THE WOLVES EXPERIENCE. 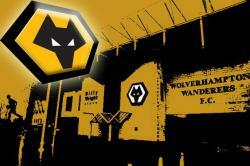 Come to the Wolves training ground,where you’ll meet the manager and his coaching staff and players. Watch them in training,hear what the boss is expecting from them the following day – then be treated to two tickets in the directors’ box for the game. A NIGHT IN THE COUNTRY. Visit the Royal Oak at Bishopstone in the sleepy Wiltshire countryside for a memorable night away from the daily cares. 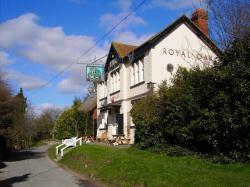 The Royal Oak has picked up many awards down the years and it’s in both the current Good Pub and Good Food Guides,plus the Michelin Pub Food Guide for the past eight years. The Times Food Editor says it’s ‘One of my top 10 favourite places to eat’. Enjoy a three-course dinner for two,plus a bottle of Prosecco,then adjourn next door to their new luxurious bijou hotel. In the morning,a classic countryside breakfast,featuring locally-sourced ingredients,and then a tour of the nearby organic farm,with its stunning views and fascinating wildlife. The highlight will be getting close up to the famous Gloucester Old Spot pigs – the providers of your brekkie bacon! 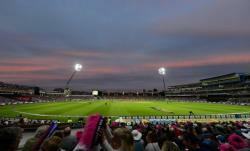 THE EDGBASTON TEST MATCH EXPERIENCE. On August 17th this summer,cricket history is made,as Edgbaston stages the first day/night Test in this country,against the West Indies. Ashes hero and Warwickshire’s Director of Sport Ashley Giles will be your guide on preview day – the 16th – showing you round the dressing-rooms and players’ gym,then out to the middle,where you’ll meet the groundsman,get a close-up of the pitch,watch the net practice at close quarters and be introduced to some of the England players by Ashley. Next day,you are the guest of Pat Murphy in the Radio 5 Live box,seeing how he reports live on the action and liaises with the studio back at base. You’ll be able to go out in the middle with the Test Match Special team,as they organise live interviews with the players,bring news of the toss and get an intimate feel of the tension surrounding day 1 of a Test Match. Lunch will be provided by Warwickshire CCC in the media centre and at close of play,accompany Pat Murphy onto the boundary edge and watch him conduct live interviews into Test Match Special before it goes off air. And if it rains,you can just sit back in the 5 Live commentary box and listen to the gossipy chat provided by all the former England players who pop in regularly! So bring your autograph book. This is an item for two people. The deadline for this will be Sunday,July 30th,to allow time to track down the successful bidder before August 16th. A GIFT PACKAGE FROM WEST BROM – A pair of gloves worn and signed by England goalkeeper Ben Foster,three pairs of boots used by Darren Fletcher,Johnny Evans and Chris Brunt – all signed – and four tickets for a West Brom home Premier League game next season. And a shirt signed by the West Brom squad. A framed England bat from the 2007 home England series v India. It's donated by Kevin Pietersen, who scored 2 centuries in that series. Among the others to sign are Andrew Strauss, Alistair Cook and Jimmy Anderson. 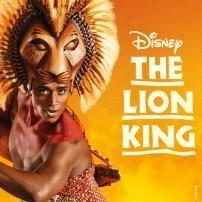 Four tickets to see The Lion King in London’s West End,PLUS a tour backstage. Now in its 18th year at the Lyceum Theatre,it’s been seen by more than 80 million people worldwide. Only five musicals in West End stage history have run longer than The Lion King. Date to be mutually agreed from October onwards. SINGING THE BLUES. 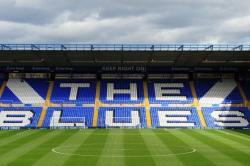 Be the matchday guests of Birmingham City's platinum sponsor No 5 Barristers' Chambers in their box at St Andrew's. Free parking,buffet and drinks for at least 4 hours. 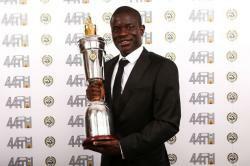 Have your photo taken with the Blues' Man-of-the-Match. A choice of 4 home games,to be negotiated. For 2 adults. AROUND GLENEAGLES WITH IAN ROBERTSON. Join the BBC's rugby union correspondent for a round of golf on the historic PGA Ryder Cup course. 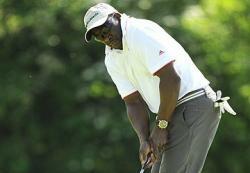 Robbo will host a four ball with three others,with golf carts supplied. Lunch is included,where Robbo will regale with you with his legendary golf,rugby and horse racing anecdotes,that have entertained after-dinner audiences for decades. 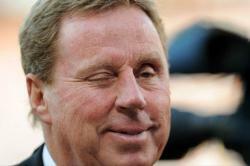 Keep Right on with Harry ! The Birmingham City manager will come and have a private chat before the match,giving you his thoughts,and then you enjoy the club's hospitality in their Legends' Lounge at St Andrew's. A two course gastro menu with full waiter/waitress service,then watch the game from a padded seat in the KOP Director's Box with half-time tea or coffee in the lounge. Complimentary matchday programme provided. For 2 people. Applies to a Category C match. LUNCH WITH STEVE BRUCE and IAN BELL. One's the Aston Villa manager,the other's a huge Villa fan.But they won't just discuss Villa matters in a cosy pub in the Warwickshire countryside. Hear Steve's tales of playing for Alex Ferguson at Manchester United and what it's like managing for almost twenty years. Find out what Ian thinks of England's forthcoming Ashes tour of Australia. Having played in five successful Ashes series,he'll know what he's talking about. Presided over by Radio 5 Live's Pat Murphy,who'll organise the drinks,order the food - and drop in the odd spicy anecdote! CAROL KLEIN IN YOUR GARDEN - BBC Gardeners' World favourite Carol Klein will spend a day in your garden,giving help and advice. With a wealth of gardening experience that shines through so enthusiastically in her TV presenting,books,newspaper & magazine columns Carol will happily share with her trademark warmth the expertise that's seen her exhibit at more than 200 RHS shows,winning many gold medals. Carol lives in North Devon but she'll travel to almost anywhere for this,in fond memory of her GW cameraman colleague,Andy Payne. One of the Premier League's most valuable stars,winner of two successive league titles and the PFA Player of 2016/17 signed this Chelsea shirt at the awards ceremony in the Grosvenor House Hotel,April 23rd. A certificate of authenticity is provided. 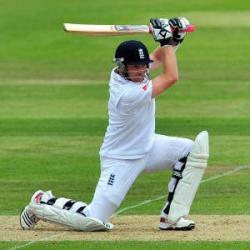 Three golfers to join one of England's most popular cricketers in recent decades at his club. Gladstone will pay for 18 holes at the Cotswold Club,Chipping Norton then at the 19th,regale you with some great stories from across the sporting world.